Water-resources data were collected to describe the hydrologic conditions at the Allison Woods research station near Statesville, North Carolina, in the Piedmont Physiographic Province of North Carolina. Data collected by the U.S. Geological Survey and the North Carolina Department of Environment and Natural Resources, Division of Water Quality, from April 2005 through September 2008 are presented in this report. Data presented include well-construction characteristics and periodic groundwater-level measurements for 29 wells, borehole geophysical logs for 8 wells, hourly groundwater-level measurements for 5 wells, continuous water-quality measurements for 3 wells, periodic water-quality samples for 12 wells and 1 surface-water station, slug-test results for 11 wells, and shallow groundwater-flow maps. In addition, the geology and hydrogeology at the site are summarized. 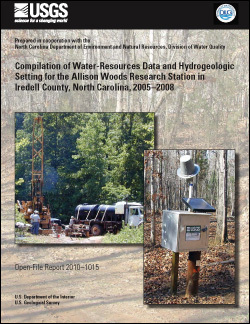 Huffman, B.A., and Abraham, Joju, 2010, Compilation of water-resources data and hydrogeologic setting for the Allison Woods research station in Iredell County, North Carolina, 2005–2008: U.S. Geological Survey Open-File Report 2010–1015, 56 p.